We came across this on Netflix and watched it on a whim. It's essentially a series of segments about Christmas trees and Christmas tree-inspired displays judged by TLC to be "extreme." 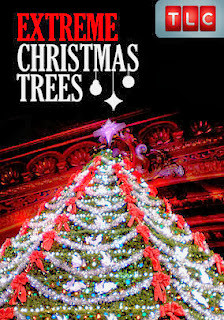 The first segment is about a thirty-two foot tall Christmas tree that gets wedged into the Biltmore House by hand. There was a ridiculous amount of pageantry surrounding this: they actually drove it up the house in a horse-drawn carriage, a choice that almost led to disaster because horses, unlike trucks, don't have an emergency brake. The narration was particularly egregious while the tree was going up: they tried to ratchet up the tension. "With victory just a few feet away, the unimaginable happens." For those of you following along, the unimaginable was that they ran into a moderate snag which they quickly corrected before any damage was done. Of course, they did - these people are professionals, and they can get the job done even if they have to do so without machines, presumably to keep this "authentic." Next up was a tree-shaped display in Rockland, Maine built out of lobster traps. The whole thing is ridiculous, of course, and the editing and narration makes a point of playing up the danger. That said, this is clearly being done without the budget of the other segments, and you can't help but appreciate the community's display. It may be built out of lobster traps and decorated with buoys, but I'd say it's a hell of a lot more authentic than the pine they put in the Biltmore. The third segment is about a Michigan "singing Christmas tree," otherwise known as a high school choir with way too large a budget. The tree-shaped stage is certainly impressive, but the adults running the event are fairly unlikable. I'm glad everyone's in the "Christmas spirit" and all, but is holding the record for the country's largest singing tree really worth having kids pass out from heat exhaustion? Next up was a ten foot tall cake shaped like a Christmas tree. It's impressive and all, but anyone who's spent any time watching Food Network has seen much better. The next segment was part cool and part disgusting: it featured an artist specializing in antlers who made an "antler Christmas tree." I'm not sure it really qualified as "extreme," but then there are better terms for most of the trees and displays this special focused on. It's certainly a different take on the concept, though, and the final result was impressive. The sixth segment was the strangest, focusing on a "entrepreneur" in England who set up a 30' tree in his house, upside down, going through a few floors. It's never really clear why he's doing this - he half-joking claims the idea came to him in a "moment of madness," but I get the impression it's some sort of publicity stunt. The end result is neat, but it's not hard to come up with alterations which could have improved the effect. Or, at the very least, not have necessitated punching holes in his floor and ceiling. It would have been nice to get an actual answer as to why this was done, who this guy is, or at least how the project was paid for. The last segment is about a bed and breakfast in Georgia where they put up a Christmas tree decorated with two-hundred-thousand dollars worth of blown-glass ornaments. As a rule of thumb, I generally consider blown-glass ornaments to be the worst you can get, though I'll admit these were incredibly impressive, and the finished tree was awesome. Was it $200,000 worth of awesome? No, probably not. But I can certainly appreciate a great collection. The selection of features wasn't bad, but the overall special was, mainly due to the generic and cheesy narration. If they'd gotten a better narrator and writer, this would have been far less annoying. It also could have used a more appropriate gimmick. To tie it all together, they got at least one shot with someone involved explaining why this tree was extreme. But of course they weren't all that extreme. What this did accomplish was showing how varied Christmas trees get. That would have been a far better approach. This is floating around Netflix, if you actually can't think of anything better to watch.